The Open Space (Andrew, Lauren, Steven) . . . This link is to the video documentation of a trandisplinary happening collaboratively generated by Andrew Hurley (RCID-packaging science), Lauren Mitchell (RCID-architecture), and Steven Holmes (RCID-rhetoric). The Open Space installation was created in response to Martin Heidegger’s essay, “What art poets for?” and Jacques Derrida’s and D.Diane Davis’ writing on hospitality. Cynthia Haynes, instructor of record for this RCID doctoral seminar on “Electrate Hospitality” (Fall 2010) challenged her students to unbuild the inhospitable. Our goal was the creation of sites of hospitality that revealed the liminal zone of (im)materialization between unconditional and conditional hospitality to the Other. Through the process of subjecting each student’s disciplinary knowledge (architecture, packaging science, and rhetorical theory) to interdisciplinary collaborative invention, a transdiplinary product reducible to no one participant’s specific interests or discipline emerged. The consensus was that each wanted to ‘build’ a physical structure and each was able to contribute a unique element of the overall artistic vision. Within this collaborative project, a ubiquitous architectural threshold was used to exaggerate the many cognitive thresholds required in order to digest theoretical discussions surrounding hospitality. The spatial installation considered the boundary as that from which something begun its presencing in lieu of a moment at which something stops. Visitors to the installation were hailed, asked to select a weapon of their choice, and invited to enter the structure. Each space folded within a space took form as a series of doors with enigmatic symbols that articulated a variety of relationships to the Other. Each choice engaged new choices that asked entrants to contemplate their relationship to identity, to avataring, to Being. Lauren’s reflections: we each brought some expertise into this collaboration. We also were intentionally non-hierarchical in our decision-making. Thus, the project made progress in transforming each of the fields of Packaging Science, Architecture, and Rhetorics. It was a joy to be a part of this project, and the class. Steve’s reflections: I kept referring to it poorly as a “deconstructed video game” or “whatever the Object’s equivalent of the video-game-w/o-organs would be”. Non-circuitous algorithms in space, maybe. I’m still in the process of trying to determine what exactly this thing means to us. A spatial pedagogy? A chance reflection upon Latour’s actor-network theory? Andrew’s reflections: From an engineering perspective, this project remixed traditional manufacturing processes and equipment in unique and novel ways. Mixing art, architecture and packaging science within the Rhetorics bowl created a marvelous soup. This specific installation was made possible with a generous donation from Pratt Industries (Greenville, SC). The Sonoco Institute of Packaging Design and Graphics at Clemson University generously volunteered its space, equipment and rendering facilities. The project is still ongoing and in the process of entering a textual-journal conversation aimed, the authors hope, at JAC along the lines of the rhetorical-pedagogical implications for trandisciplinary projects. Forty years ago this month, in November 1969, Marshall McLuhan adopted as metaphor a ‘line’ from the cold war—he re-materialized the DEW line as artistic practice. The DEW line, short for Distant Early Warning system, consisted of a chain of 63 radar and communication stations stretching 3000 miles across Arctic Canada at the 69th parallel. It was completed in 1957 during the height of the cold war. “The DEW line became a perfect metaphor for McLuhan on the role of art and the artist at a time of rapid technological and social change” (Kuskis) According to McLuhan, “I think of art, at its most significant, as a DEW line, a Distant Early Warning system that can always be relied on to tell the old culture what is beginning to happen to it” (Understanding Media; Kuskis). In McLuhan and Baudrillard: The Masters of Implosion (Routledge 1999), Gary Genosko remarks in an end note that Marshall McLuhan’s Dew-Line Newsletters (published between 1968-70) were often accompanied by supplementary materials such as posters, slides, or playing cards (15; see also Trexler). As a complement to McLuhan’s Dew-Line cards (issued with the Nov-Dec 1969 newsletter), students in the RCID 812 seminar on “Cultural Critiques of Mechanical Reproductions” have created a series of Baudrillard “DEW Line” cards to be randomly applied to a critical/cultural/economic/ethico-political problem in the manner McLuhan envisioned playing with his cards. According to Genosko, the cards served as a “brainstorming device. Each card contained an aphorism in relation to which problems could be discussed, stormed, bounced off, etc.” (15). 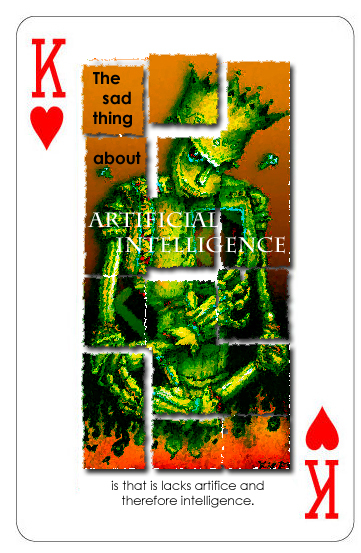 Given the nomination of Baudrillard as the “French McLuhan,” it is time to play the game of post-cold-war techno/shuffling and deal the Baudrillard cards to the RCID blog . . . one at a time. Here is our first card in the series. What problems do you think it suggests? [image remix by Curtis Newbold and Sergio Figueiredo] . . .
Genosko, Gary. McLuhan and Baudrillard: The Masters of Implosion. London: Routledge, 1999. Kuskis, Alex. “The Distant Early Warning (DEW) Card Deck (1969)” McLuhan.ca Global Research Network (3 Nov 2009). Trexler, Jeff. McLuhan DEW Line playing cards. 2006. (3 Nov 2009).